If you are a direct sales or home party plan business owner, a great way to get new contacts and leads for your business is by doing a vendor event. There are several kinds of vendor events you can set up a display booth at right in your local area. A few examples include community street festivals, county fairs, school and church bazaars, charitable events and direct sales networking group events. Where do you find vendor events? The best way to find out about these events is to ask your friends, family and customers if they know of events. Search FB for local Vendor Event Groups in your state / area. You can also check out your local newspapers community calendar of events and the events on sites like Craigslist, Eventlister.com and Craftlister.com You may also want to call your local Chamber of Commerce or Tourism Authority. For schools and churches, sometimes you just have to call and ask if they have events coming up. When you are calling to check on the events there are a few things you need to keep in mind before signing up. First, you want to make sure that there are no other consultants from your company already signed up and that they do not allow more than 1 consultant per company. Pretty much all direct sales companies do not allow more than 1 rep per company at an event. Also, find out how many years the event has been established and how many people attend on average. Other things to consider are whether it is indoors or outdoors, whether you need to provide your own tables and a tent if outdoors and if and how they advertise the event to the public. Cost is a big factor to consider before deciding to pay for a space at a vendor event. For an event that tens of thousands of people come through, it may be worth it to pay $250-$500 for a booth if you can split the cost and hours with several other team members to make it affordable. If an event is not that big, newer or has not had high attendance in the past, I would not recommend spending more than $50 for the booth. It is always good to split the booth with a team member if you can. Not only does that reduce your cost, but it gives you someone there to help or watch the booth if you need to leave. Once you have found an event or two to participate in, it’s time to get yourself, your products and your display ready. If you need to provide your own tent or table, you may want to see if you can borrow these for your first few events until you make some extra money to buy your own. You will want to purchase some tablecloths, preferably at least one with your company’s logo. I recommend using dark tablecloths, products and signage really stands out and pops more against a dark tablecloth. You can also get a large banner or sign printed with your company’s logo (and your name & contact info). You can put the banner on your table, on your tent or on the wall behind your booth. This helps draw attention to your booth. As for products, I recommend bringing your business kit that new recruits get for signing up as part of your display. Then bring host specials and customer specials for the rest of your demo. You are going to want to be focusing on recruiting and dating parties so having those items and signage that goes along with it will help. Be sure to have catalogs, sales fliers, business cards and party and recruiting packets too! If you plan to sell inventory on hand, it is always good to have a credit card processor so you can accept credit cards. More than half of my purchases were always credit cards. Paypal offers a card reader that works with your smartphone or Tablet. I personally prefer Square card reader. With Square the $ is deposited directly to your bank account the next business day. You can set up a Square account for free through my link & get $1000 of charges with free processing fees for 180 days here. Create or print some signs that say things like “We’re Hiring” and “Ask Me About Our Host Bonuses”. Signs like that help start a conversation. If your company allows you to sell your products cash and carry then be sure to bring a good selection of products to sell and set up a clean display. I like to use small metal shelves on my table to organize my display and my cash and carry products. It helps my booth stand out from the others and allows me to showcase many more products than just stacking a few on the table. Be sure to dress for success or match the type of event you are attending. Wear a shirt with your logo and casual dress pants or a logo or polo shirt and very nice jeans. Depending on the event and the location of the event, I typically wear nice jeans with a logo shirt. Most of the events and the areas my business is in are outdoors or more casual so I would look out of place and not as approachable if I were wearing business attire. If your event is in a higher class area or business/location you may want to dress up more. Whatever you choose to wear, make sure it is ironed and looks nice so you represent your company (and yourself) well. The most important reason to do vendor events is to get those new contacts and leads for your business – contacts that you can follow up with. The easiest way to do this is to a drawing for a prize! It can be products you have in stock or a gift certificate. The amount is up to you and should be based on the size of the event. For a smaller event, I may do just a $15 gift certificate. For a very large event, I may do a gift basket with $100 worth of products in it. I put out a few clipboards with a drawing slip and a sign about the drawing. I tell everyone “there is no obligation, they don’t have to be present to win and I won’t call and harass them unless they just want me to.” That usually makes them smile or laugh and lightens the mood. 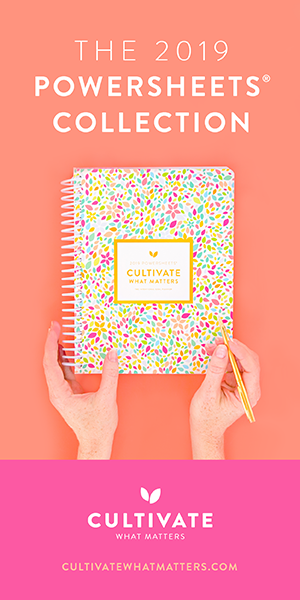 The drawing slip asks for their name, address, phone #, email and then has a few checkboxes asking their interest in learning more about earning free products by hosting a party, earning an income by beginning their own business and learning more about our fundraiser program. I do ask them to fill it out completely. While they are filling it out I will have a quick conversation with them. If they check off yes on any of the boxes I will go ahead and follow up right then and see if I can share more information or find out more about what specifically they are interested in. Remember to smile and be friendly to everyone! Say hello, ask them how they are, compliment them, invite them into the booth. Use open-ended questions to start a conversation. How long has it been since you’ve seen our products? How long has it been since you’ve been to one of our parties? What problems are you having that we can help you solve with our products? Be genuinely interested in helping people. 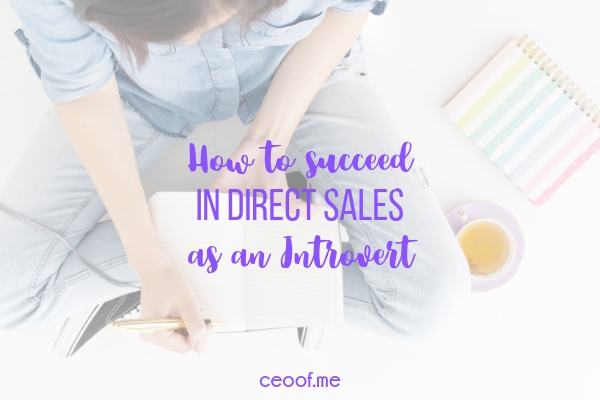 You do not need to be pushy or salesperson like to be successful in direct sales. You may give out 200 business cards and get 100 drawing slips filled out. You may even get a booking or two on the spot. 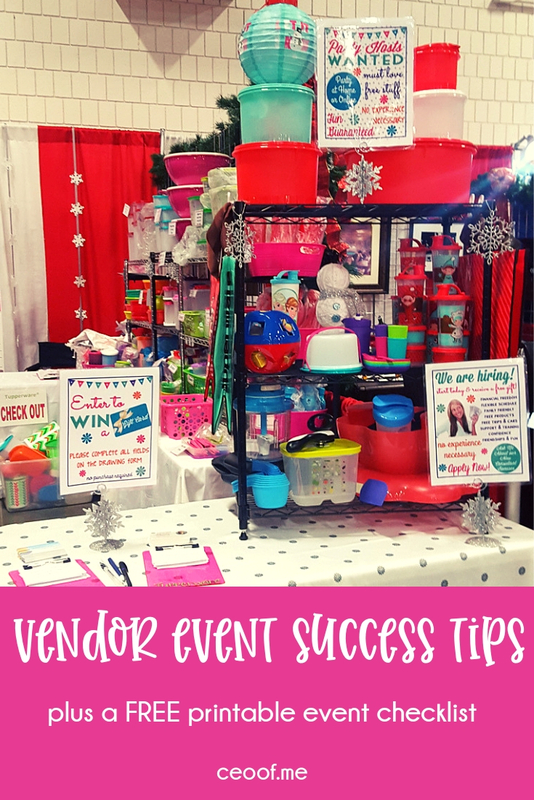 All of that is great and an essential part of building your business, but you need do to one more thing to make sure your vendor event is successful. You must follow up. Let me repeat, you must follow up! “The fortune is in the follow up” they say and I promise you that is the truth! You need to call your leads within 24-48 hours to follow up, especially potential hosts and recruits. People lose 10% of the excitement each day so if you wait a week to follow up they are already going to be 70% less excited than when you spoke to them. Be sure to add people to your email list if they included their email and marked that they wanted to be added to your newsletter list. I always emailed everyone who didn’t check off any particular boxes and thank them for stopping by my booth and offer a coupon or shipping discount on their first purchase made within 30 days too. Vendor events can be a great way to build your direct sales business. When I started my business I did not know that many people and did not have a lot of local family and friends. They are the main way that I have grown my local customer base during my 9+ years in direct sales. 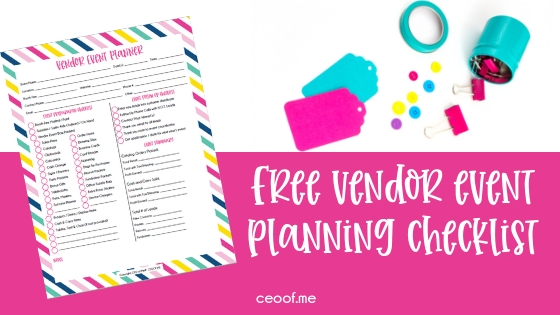 Be sure to grab my FREE printable vendor event planning, prep & follow up checklist below before you go! What about you? 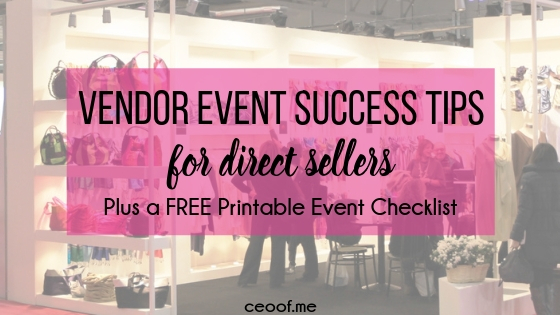 Do you have any other tips for successful vendor events? I would love it if you would leave a comment below and share this post with your friends! Hi Jessica, thanks so much for stopping by and leaving a comment! Wishing you much success & hope to connect with you more! One of the most effective ways to market your direct sales business is through local vendor events, craft fairs, bazaars and flea markets. With a little creativity and know how, these events can be a fun and exciting way to meet new customers, book additional parties and sponsor new team members. Read on to learn more. I’m an introvert. Not the best set up for a successful direct sales business, I know. But I’m not shy. So I appreciate these tips because I’m going to push myself out of my comfort zone and look for some vendor events. Here’s hoping! Pray for a sister! 😉 Richest blessings! I am an introvert too but I do really well at vendor events and really almost prefer them to home parties. I think it’s because the people coming by your booth or stopping in are interested to see what you have and the conversations are short and sweet as you work to connect and help them. They really helped me explode my business and continue to do so! Wishing you much success, you can do it! I love attending vendor events as a customer so I am looking forward to attending as a vendor. My only concerns is I don’t know how much inventory to bring and if I can afford to bring how much is necessary! Is it unreasonable to take orders at an event? How much inventory should I have? Hi Del! It really depends on a few things – first if you are with a direct sales company- does your company allow you to sell cash & carry? Some companies do not allow that, so be sure to check your companies guidelines. There are some events that I have done where people will order and I can get a large amount of orders. There are some events where people just will not order at all, they prefer to be able to purchase cash & carry. I am not sure if it is the venue, they don’t know me, they don’t feel comfortable giving a stranger $ and having to wait 2 weeks for their orders or what. I have noticed that the smaller events like at schools or churches or networking events people seem more comfortable ordering. The larger events, street festivals, events that are for 2-5 days, people seem to prefer to purchase cash & carry instead of ordering. 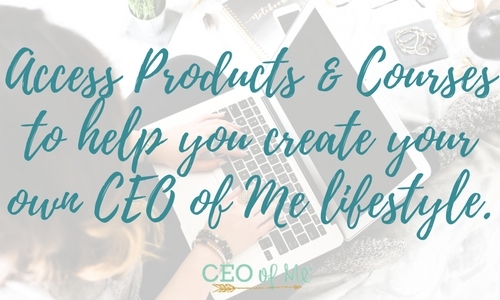 I never recommend investing a lot of money in products until you have tested the waters a bit or are making a larger income in your business and know that you can easily sell the items and make a profit. The main reason to do vendor events is for advertising your business, to get your name out there, to do a drawing to get contact info for potential customers, hosts and recruits. I would encourage you to not get so caught up in selling cash and carry that you lose focus on gaining new leads for your business. I typically offer a “Show Special” for orders like flat $5 shipping for all orders or free shipping over a certain amount to help encourage first time orders. Hope that helps & good luck with building your business! Thank you for all the advice Misty, I appreciate! I love your website and really enjoyed your article! Full of great tips. Direct sales isn’t for everyone nor is working from home but if it fits your lifestyle- it’s so wonderful. I love working from home in my direct sales business. Amy, thanks so much for your sweet comment. I am so glad my article helped you. I wish you much success! In that I do a booth most Saturdays at a local outdoor marketplace, your info is extremely useful to me. I’ve been inventing myself so it’s wonderful to have a bit of guidance and some awesome ideas! Thank you! Where did you get that metal shelf? I really want something like that for my displays but don’t know where to get one. Hi Stacy! I bought them at K-Mart. I believe Walmart sells them too though. I actually have several of these I use them for my bigger events/bigger displays. They work really great! I believe I paid around $15 for them on sale. I have 2 silver metal and 4 black metal ones like this. They are around $22 regular price, but if you watch for the sales you can get them for much less. Hi Lena, I don’t unfortunately. This was a cell phone pic from a couple years ago. I need to take some pics at my upcoming events and update this post. It is totally ok if you don’t have cash n carry. Set up your kit and make the display look really nice with bright colors and a nice tablecloth and have various signs out with your current host specials, recruiting specials and any order specials too. The most important part is to connect with the people who come through. Smile, be friendly, genuine and make those connections. Be sure to get them to fill out a drawing slip so you can get leads to follow up with. Give out business cards and don’t forget to network with the other vendors there too. Often times I get as much business from the other vendors as I do from others. Wishing you tons of success! How was your launch party? How have you been doing with Origami Owl? 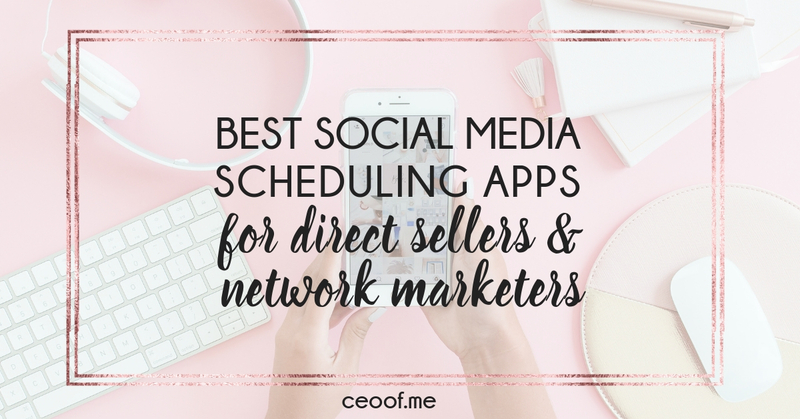 I started less than a month ago and I’m reading everything I can find about direct sales and vendor events. Do you have any tips or suggestions for a newbie? Thank you! Hi, I Just want to know how to do direct sales for an event business and is it good to use direct sales as a way of promoting/marketing an event business? Hi John, I have a good bit of info in this post already. If you are looking for additional training in direct sales then I suggest reading any of the books by the DSWA, Mary Christensen, Christine Northrup and also the trainings by Karen Phelps. Hope that helps! Great blog!!!! Thank you so much. I just had a vender event this weekend & I will be sure to follow up within 48 hours! Thanks Gleneisha! Good luck with all your new customers and contacts! Great information. Thank you, Misty! I’ve found the best website for finding vendor events in your area. You can search by zip code and put in how far you’re willing to travel, what type of vendors ate there, and the contact info for the person signing up vendors. There is a yearly fee but well worth the price if you’re interested in these types of events. Check it out at http://www.festivalnet.com. Good luck! Thank you Misty for all your great information.. Thanks Marie! I agree Festivalnet.com is a great site for finding events! 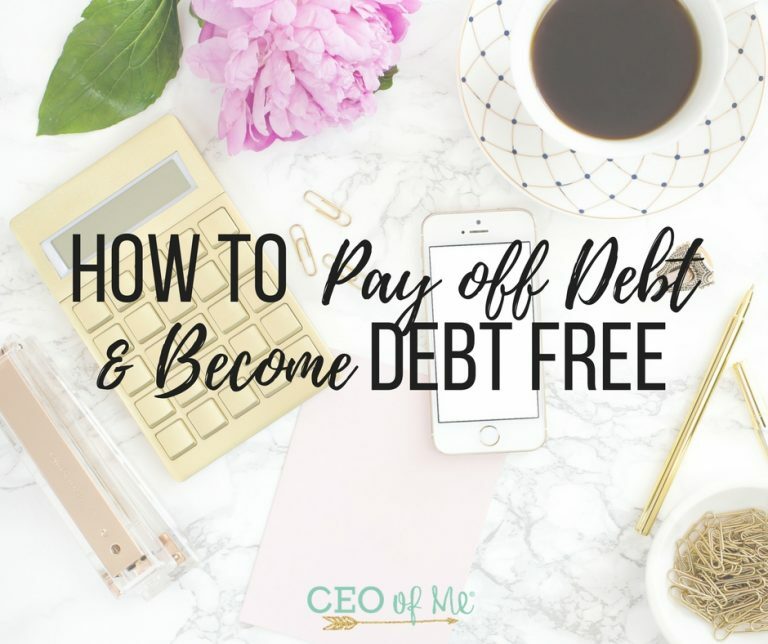 Thank you Misty!This was a very informative blog post! I favorited it and I will share it with my team! I really appreciate the work you put into this and your expertise on this subject. I have been an Independent Presenter for Younique Product for a little over 2 months now and I have done a few shows with my sponsor. I found them to be really fun and a great source of new team members! I am ready to do some events with my downline now and found you while searching for events. Thanks again! Hi Joy, thanks so much for your kind comments & sharing my post. I love vendor events too & I’m glad my post was helpful to you! Wishing you much success in your business! Thank you for the great ideas and advice. Thanks for commenting Tammy! You are welcome, I hope it helps you out! Thank you for this post! I’m doing my first couple of vendor events next month and I’m trying to get prepared. This was very helpful! You are absolutely right! The key is the follow up…and to do it very promptly. It makes a huge difference! I have been thinking about doing direct sales, and I am so nervous! this article gave me so much information, and I really think I’ll give it a shot. Thank you. Thanks Kimberly! I wish you much success in your new venture. Direct Sales is so rewarding, financially and personally! What business are you thinking about joining? Hello! I just want to thank you for posting this blog! I am doing my first vendor event this weekend! The funny thing is its Tupperware also!!!! I just started to sell it two weeks ago! I am really excited to be on this adventure! You are welcome Adriane! 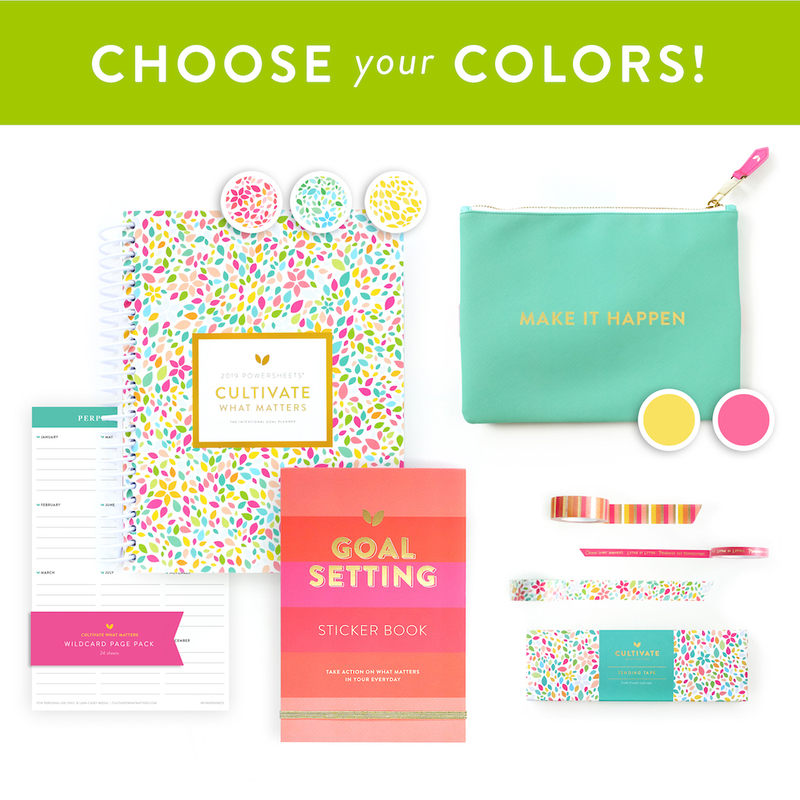 Welcome to Tupperware, it is a wonderful company and you are going to love it. I wish you much success! Thank you for this post – very informative and helpful! Wow, Wonderful article on vendor events!!!!! Thanks for posting! 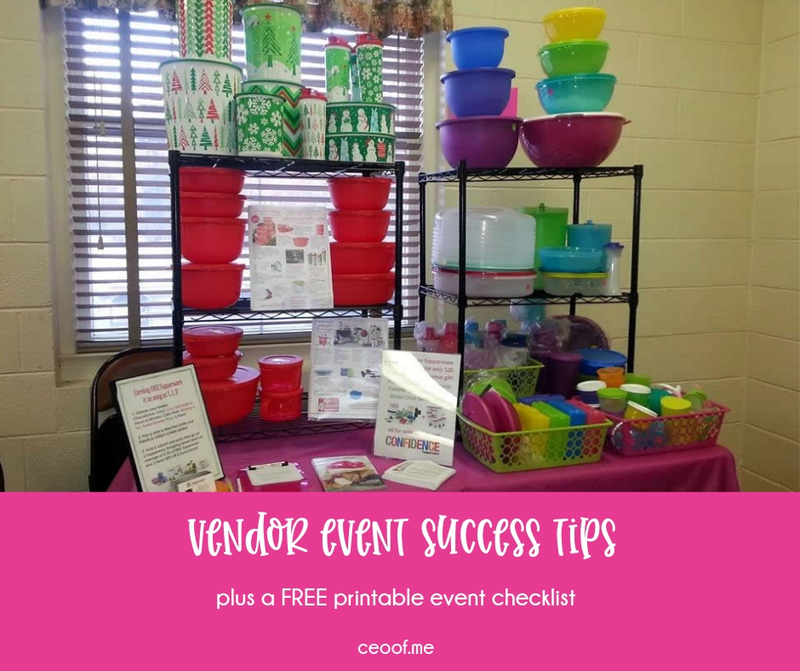 I shared it with my networking group because I think the tips will be useful for almost every business that wants to do vendor fairs! Great advice. I knew follow up was important but hadn’t considered how quickly I should respond. I never thought of it in terms of losing “excitement.” thanks. Thank you so much for sharing this. This is great. Will definitely try that!!! Wow…thank you for these great ideas! I do vendor events monthly and I never thought about a raffle! Thank you so much for your terrific blog. I just started with Younique and I am attending my first vendor show in a couple of weeks. I feel much more confident after reading your great tips!!!! Hi! Great blog! I’m new to this industry and was curious, when you team up with others for an event, how do you split up the prospects with the other representatives from your company? Is there ever an issue or confusion as to how potential customers would be split up? Thank you! Hi Natalie! Thank you & that is a great question. With my team what we do is try to alternate speaking to people or maybe have 1 person up front for an hour & the other working the check out table then switch. If you start talking to someone who wants to do a party or maybe needs a local consultant we’ll ask where they live and if they live closer to someone else working the event, we’ll introduce them and let them help them. (Doesn’t make sense for me to drive 40 minutes if I have a team member who lives 5 minutes from the customer.) If you speak to someone and have a real conversation / connection with them (or if you already know them) then they are your lead. What we will do is put our initials on the back of those lead slips so after we do the door prize drawing we can make sure each person gets their personal leads back. For the other leads that we either don’t talk to in depth or those that just fill out the form and hand it in, we don’t put initials on those and we will just split those up evenly after the event. We do try to give leads based on area too so if a lead lives closer to me I would get it, closer to one of the other team members there, they would get it. (That is for the ones where we didn’t have a conversation / connection with / book a party with…) Just lay the ground rules out up front and make sure everyone understands and is on board. Also some of my team members do not want to recruit or build a team so when they work events they will refer recruit leads to me or the other person there that is a team leader or working to promote. Hope that helps! I love your site!!! I sell Tupperware as well and love every minute of it!!! I love the signs you place out in your display. Can you share them? I would love to set signs out, but don’t have the talent to make them look that nice. Hi Kelly, thanks for your kind words my fellow Tupper sister! As for the signs, I am actually working on putting together some additional Vendor Event Training and will have several signs and templates I’ll be including in that. I hope to have it all ready to offer in the next few weeks so stay tuned! I am looking for networking and vendor events to go. I am a gourmet healthy coffee distributor. One of the issues i face comes from the popularity of my product; if is not a “large” event, they are already selling coffee. Any advice. I leave in the northeast, Albany NY. Again, thanks for taking for sharing your vending tips with us. Hi Marie! How interesting, I can’t think of many events I’ve been to or participated in here in NC where they provide coffee. As long as they are not selling another competitor’s coffee or there isn’t another coffee vendor I don’t see how it would be a conflict for you. You could still market you business, network and work to get leads and make new contacts. As for other events, check out the resources I mentioned in the post like your local paper, chamber of commerce, eventlister.com, festivalnet.com. With your business you could also consider contacting local businesses about being their coffee vendor or setting up on their lunch or break rooms maybe. Wishing you much success! I am a Tupperwear consultant and found your blog to be so informative. I am doing my first vendor event in a week and I’m so excited and nervouse. I do have a couple questions for you if you wouldn’t mind answering. I’m still new and in my confidence start program and have not earned a table cloth what would you recomend for signage? The show is a small holiday fair at a local school. Also what’s your thoughts on small give outs like whistle straws or the citrus peeler? I live is a small rural area in NH and have had issues booking parties so I am really hoping that this event will get my name out there and for people to see Tupperware is still here and we have not disappeared. Lol I have heard this a few times. Hi Jaime! Welcome to Tupperware. 🙂 I think a solid black tablecloth is nice if you don’t have a logo one yet. The flier from Tuppreware that comes in your kit “where will the party take you” for recruiting is always a good one. Also a flier with the current host bonus items and offers is good to have up. Just be sure to do a drawing and talk to everyone, ask them how long it has been since they have been to or hosted a party. If they aren’t willing to host, ask if they would like to attend a party and then you can try to do a party yourself and invite all those people who said they would like to attend but not host. You can also offer a bonus if they pick a date on the spot (but wait and give them the product when they actually hold their party so you aren’t out any $ or product.) I don’t give out those items, the only way I give something away is if someone places a certain size order or joins my team that day. Good luck with your business! 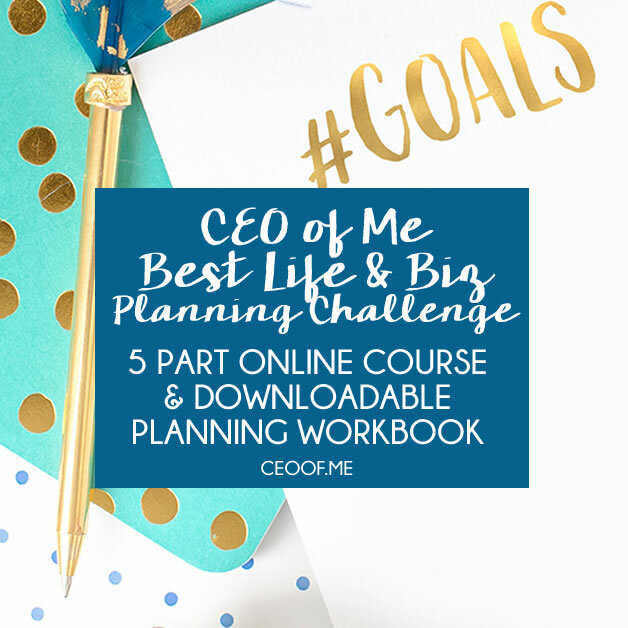 I really enjoyed this post and will use these ideas…thanks for sharing! Wonderful tips!! My business is purely cash and carry so I’m always looking for ways to make vendor events more successful! I sell comfy clothes for women and girls (facebook.com/lularoebyann) but we are a newer company so networking is essential to grow my business! Thank you so much for sharing these tips. Very helpful stuff. I did my first vendor event last night and really wish I had seen this first. I had some of the things down but as far as asking opened ended questions, display set up and sign up sheet I think applying those things would have made the event better. I had my stuff scattered around my display table but for my next event I will use some of these tips and update you on how it goes! Hi Alisha, thanks so much for leaving a comment! I’m glad you found my tips helpful. I am sure you did great with your event and hope that applying my tips from now on will help you do even better. Thank you for sharing all your wonderful tips. I have been with my company for a year now and I love doing vendor events AND home parties. I love to meet new people and have a great time. I have an upbeat tone, I am smiling during the entire call, and still get no response. What am I doing wrong? Are my messages too long? Hi Melanie! Thanks so much for your kind comment. I usually recommend following up 5 times with hot leads. Within 24 hours, 72 hours, another 72 hours, a week, 2 weeks. If after that still no reply I just make sure they are on my email list and then I may reach out again when a new catalog, host special or sign up special comes out. I don’t think you are doing anything wrong. One thing that might help is emailing as soon as the event is over and reminding them of the time you set up to call to follow up and asking if they need to reschedule, cancel or have changed their mind to please just email you back and let you know. You have to remember that sometimes people say they are interested because they just don’t want to say to no or they are excited in the moment or they get home and their spouse isn’t supportive of them hosting a party or joining a business or maybe something really does happen and the timing isn’t good for them then. I have had people who I met at events that I kept on my email list and followed up with each new catalog that have contacted me months, even years later for parties or to sign up. 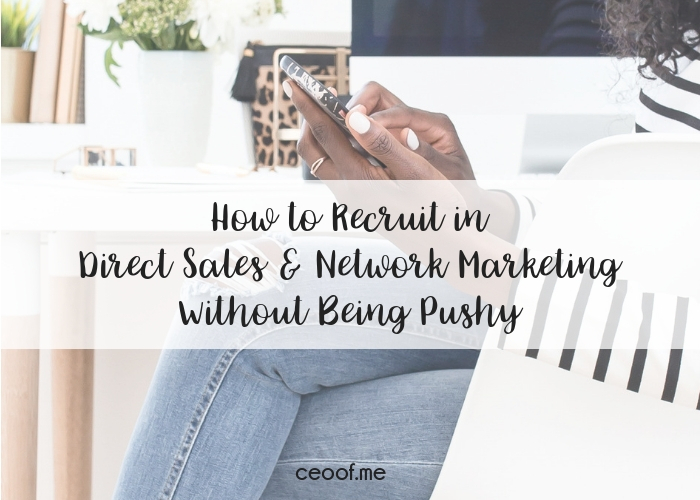 Just keep connecting with as many people as possible, keep them on an email list and work with those who want to work with you. Thank you for your great advice! It’s wonderful to see women empower each other. Direct sales, is all about building that relationship with your customer. Yes! All those NO’S will turn into a Yes. Just show up, keep it moving! Consistency is key and always follow up. Don’t be afraid to ask questions and step out of your comfort zone. Good luck! God Bless! great article!please visit my site also. I really enjoyed your article on Vendor Events. 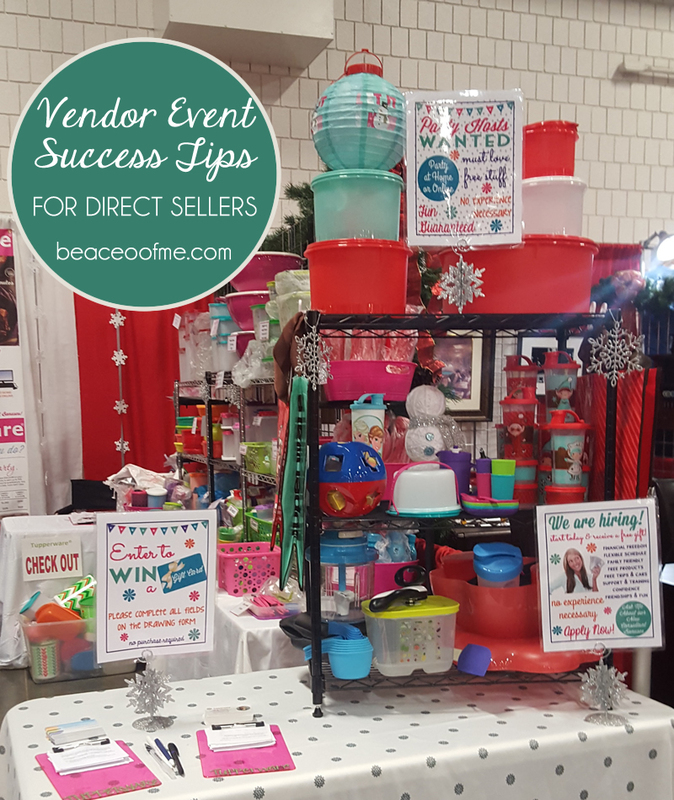 I am a fairly new Tupperware Cosultant who has struggled finding and doing Vendor Events. Do you have a specific lead sheet you find that you like most? I would appreciate any tips on finding and doing vendor events, as well as how to find and date party hostesses. I am very thankful for the success tips you shared with your viewers on this blog site. I think the information was very knowledgeable and it will help all entrepreneurs build a successful business. Thank you for sharing and I look forward to reading more post. Hi! I’m a Tupperware Consultant. I really found your table displays very interesting. Thanks for all the helpful tips. Great information/advice. I’m a distributor for Itworks and it’s health & wellness products like body wraps & detox cleanse etc. Anything suggestions with events for products like mine? Thanks Shanna! I would suggest before & after pictures and signage with wording asking questions about health, weight loss, feeling good to attract people to your booth. I know your colors are black & bright green so that can help make the booth pop if you follow that theme. Maybe even some zebra print or bright green balloons to help draw attention and get people in. Then you can ask questions, share info and get them to fill out the drawing slip. Hope that helps! Great Information! Thank you so much for taking the time to share! I wish the best to your business and much success also. We’re getting ready to do a large event where 6 different consultants will be sharing the time/fee for the booth. Do you have suggestions on the easiest way to share contacts, bookings, sales, etc. when multiple consultants are on hand at the same booth? We’ll have four consultants the first day and two the next. Hi Jeannie! So what we do with my team is we try to rotate who is upfront getting people into the booth, and then if you talked to the person directly about booking, recruiting, sale, ect, you write your initials on the back of their drawing slip. If someone just hands you their drawing slip or you don’t talk about something specific, no initials go on the back and all those are split up equally at the end of the event. I have seen other teams have each person have their drawing slips on a different color of paper to make it easier to know who each lead slip goes to. Thankfully my team was amazing and we never had an issue with anyone trying to hog all the leads or overtalk anyone. Rotating who’s upfront, who’s in the booth, who’s at checkout can help make the leads a little more even. Hope that helps & good luck with your event! Your blog is fantastic. Thank you for sharing your tips. I sell Usborne books. They have been extreme popular with my friends and friends of friends etc and my facebook parties have been going great. The one issue we have is that shipping is not as speedy as amazon so a ton of people have been asking me to do a vendor event. I found one that has around 25,000 people at and the vendor fee was only $180. I employed my husband for the day and decided we needed to go “big” to cover the initial cost and make money. My company allows me to take books out for free and then pay them as I sell the books so I took out $1500 in inventory. My question is- am i crazy for taking out so much inventory?!!!! I just know that when im at a street fair I want to shop!!! I didn’t want to run out of books…..
Hi Melissa! It really depends on the event but I have done many medium-large festivals like that and moved $1000-$2000 worth of products at them. (We had a couple multi day events where we did over $4k in on hand products sold too.) People do love to shop and be able to take items home from events. Just be sure to not focus so much on selling products that you don’t focus enough on getting leads for bookings, recruits and new customers too! If they are overwhelmed by what’s in the booth they might not notice those other opportunities so be sure to do a drawing and get everyone’s info to follow up. I hope your event goes amazing for you for sales and new leads too! If you are an independent distributor, do you need a sales tax certificate of authority? Some fairs in NY require it but I am not selling..just trying to get people interested to join. The sales tax certificate rules are different for each state and sometimes even per county within the state. Most of the time direct sellers would not be required to have one as the customers pay the sales tax on the products when they order them through the company. If however you are buying products to then resale you may need it. I would suggest checking with your State or county’s department of revenue. Thanks for the great info! I’ve got a few events coming up over the next couple of months in the lead up to Christmas. My question for you is do you display the same each time (give or take new products, etc) or do you change things up each time? I feel like I need a change, but I’m not sure how to go about it! Your tip about making products and signage stand out was a nice one. 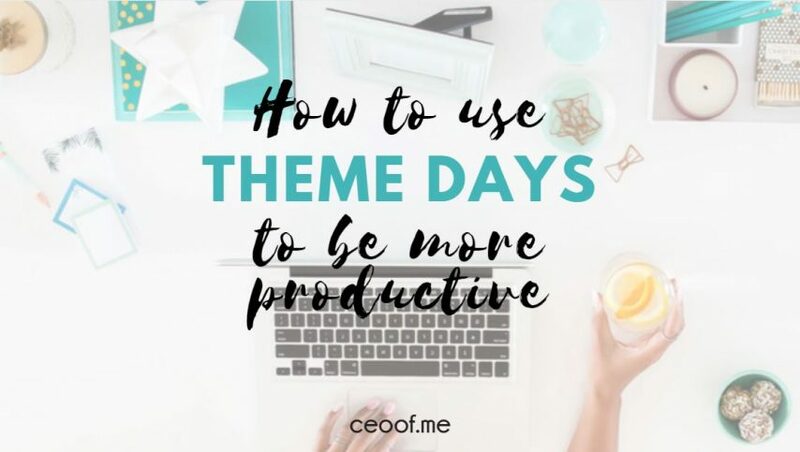 Knowing that dark tablecloths help these items stand out will be helpful for your readers. Loved reading your tips! Happy to see I have a few of these things in place. This just reiterated great follow up is key. Looking forward to my upcoming events and reading more of your blog! I invest in vendor four times a year I organize Network of Art&Soul uniting creativity under one roof entertainment, food ,fun while networking with people and other vendor. Hello I find it also very important to acknowledge a potential customer by saying hello how are you doing today etc. It usually starts up a conversation. I LOVE doing vendor events! My pet peeves is tables that do not have table cloths all the way to the ground and vendors that sit behind their tables and talk to people while sitting, usually with a cell phone in hand. I am also in NC and don’t have enough team members for the events I get invited to. Hi Tammy, oh yes, tablecloths to the floor is a great tip! I hated having product or bags show beneath. I would often times use a solid color cloth underneath then my logo one on top. Yes you have to actually “work” the booth and engage with customers. Keep doing events and sharing your opportunity and those team members will come! PS Where in NC are you? Great write up. I’m a big fan of running vendor events to help build relationships with new people. It’s great to build a community around other players in your market. Thanks for sharing. 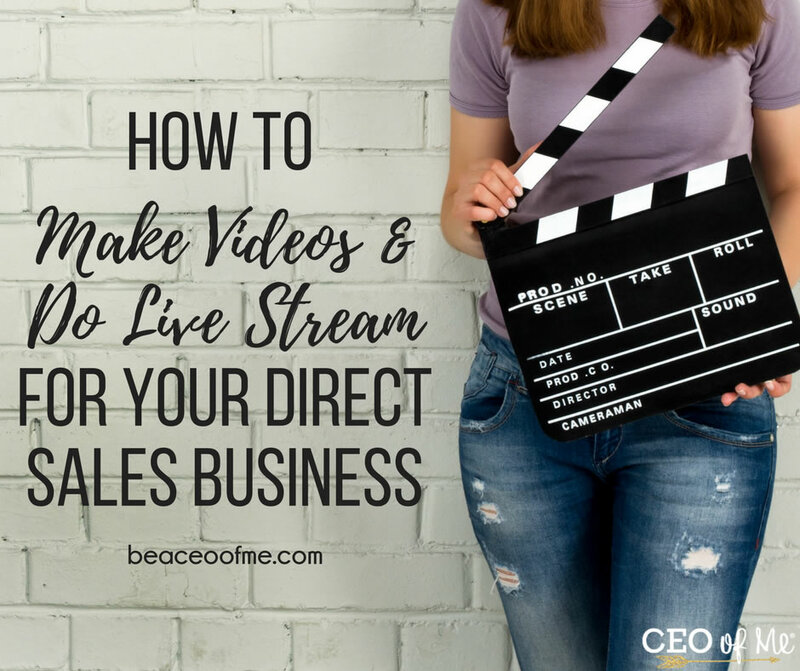 I’ve just got into direct sales and I’m learning ways to make my business a success. This vendor success tips is very helpful. Thank you for sharing. Hi Tisha, I’m so glad you found the training helpful! Wishing you much success in your new business! When talking to coordinators a few questions I started asking esp if the vendor fee is over $75 .. A) how many events have you hosted? (is this a first time event)? B) how many people have showed up at previous events you have hosted C) how do you advertise (I steer clear of events that the coordinator expects the vendors to do all the advertising when there is a high vendor fee) and D) how many other vendors do you have confirmed… if they have a large saturation of say jewelry or clothing I know I will have to work alittle harder to stand out .. 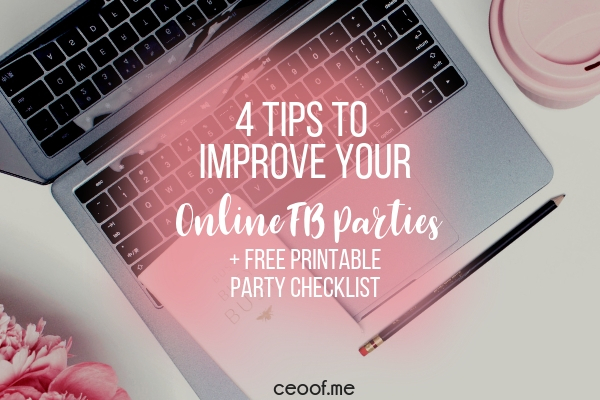 Thanks Bonnie for sharing all those great additional tips! Thank you for this article, very helpful! I just looked up the 3 local farmers markets in my area and none of them allow direct sales – they all have to have products made by you. What type of flea markets do you usually find for direct sales? Any tips would be great, specifically for Boise area if you know it at all. Thanks so much! Hi Erin, I never set up at flea markets as the company I was with discouraged us from setting up there (they felt since they were often lower priced/yard sale type events that it devalued the products). I would suggest looking more for community, school, church, charitable organization events, festivals, fundraisers and bazaars. Great information. I ADMIN several vendor & event groups on FB and was looking for helpful vendor articles to share with those who join the groups and share their emails for news on events and vendor opportunities, but I also want to share good vendor information, also, and your article is really good. So I will be sharing the link with them because it is valuable information for both vendors and event hosts that benefits only them [and you, should anyone sign up for your courses]. So my question is this. Do my table clothes absolutely HAVE to be black? I have seen other vendors (that get more sales than I do I might add) that have other colors. Some of them are in accordance with whatever event we might be celebrating. But when I asked my manager I was told that they HAVE to be black. That it looks more professional. I actually “get yelled at” for not having black tablecloths. Or for using solid color sheets (which in a rush I have used before) or the plastic dollar store table cloths. Why does it HAVE to be black? Hi Cheri! They don’t have to be black but I do think darker colors & solids make your products pop more. I have used different colors and plastic ones in the past depending on the event or season. I’m sorry your upline made you feel bad for this. 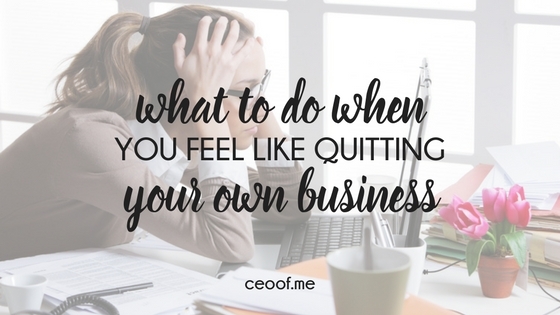 It’s your business and you can do what you feel is best. I do think the most important thing is to make sure your table isn’t too busy / full / overwhelming – that will help increase sales, bookings & recruits. Thank you for writting this blog! It was most informative and very helpful. Are vendor events really that successful? I kinda have a feeling they look like a give away bout that only catches attention of few people, not real future customers. I do quite a few vendor events, and I have collected names and those people that either said they were interested in the opportunity or hosting a party I have followed up with. Haven’t recruited or gotten a hostess from either two arenas! What I will add is more than one clipboard and offer my own raffle drawing too! Where did you find those half shelves? My mom does Tupperware and I’d love to let her know where to find some!